Jo S: I'll be needing a small truck to haul the contents of my pull-list out of my local comic book store this week: so many unmissables land this Wednesday that I've had to drop all new starts in order to stay loyal to the big favourites. 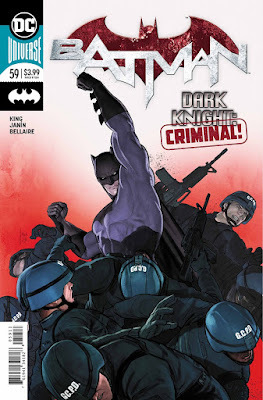 Batman #59 is a given - you know this! - but DC aren't sitting back and letting the Dark Knight do all the heavy lifting: Jinxworld titles Pearl and Cover more than pull their weight, with Mack’s artwork in the latter taking my breath clean away last time. I'm also taking a pile of Marvel titles this week; I'm sticking with Spider-Geddon for the Spider-Ham action and then a double Kelly Thompson bill: her three West Coast Avengers issues so far have gone from strength to strength and I'm very much hoping #4 continues to so intelligently skewer the behaviour of the more tiresome end of the internet. Her contribution to the writing of Uncanny X-Men #1 was visible at least in a couple of wry jokes - weekly issues of this will test my stamina, especially if they continue to be as complicated as the first, but there was plenty of action to get my teeth into, and a smidgen of mystery to pique my interest, so I'm ready to see where that goes next. Talking about Marvel Knights: 20th without talking about [spoilers] is tricky but if you didn't catch the first issue, I strongly recommend you get up to speed! From the independent end of the shelves, I'm still taking Quantum And Woody from Valiant - the story has bounced all over the place but is always great fun - and I'm rounding off with creepy, spooky Cold Spots and the devastatingly good Days Of Hate, both from Image. In my opinion it'll be a travesty if the latter doesn't bag something in the Paradoscars this year but whether you agree with me or not, take yourself over there and vote! Matt C: After a stunning sophomore issue I'm expecting Cover #3 to make the top of my pile this Wednesday. The comics creator being recruited by the CIA concept may sound far-fetched but the realistic dialogue and extraordinarily varied artwork from David Mack make this an essential purchase. Batman #59 is in next place because it's arguably the best superhero book being published right now. If you've looked through Previews recently you'll know there are a LOT of superhero books being published right now, so that's high praise indeed! One of my favourites - Days Of Hate - enters the home straight with issue #10. Few comics have felt as timely as this one in 2018. Over at Marvel the highlight is the fourth instalment of the delightful West Coast Avengers. There aren't many books that are quite as much fun as this one but writer Kelly Thompson has found the perfect groove with these characters.